Northern New Jersey may be the last place you think of for a bike ride: densely populated urban areas with way too much traffic (and potholes) to make a cyclist happy. 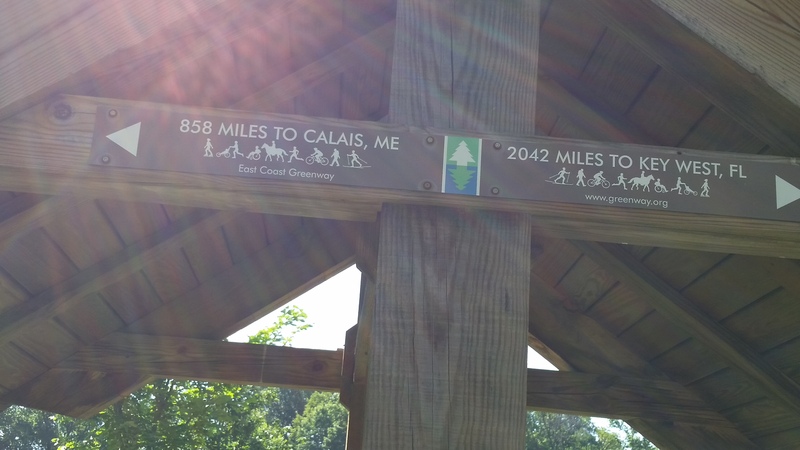 This East Coast Greenway adventure showed us we had it all wrong. And it highlights just what a melting pot this state is. 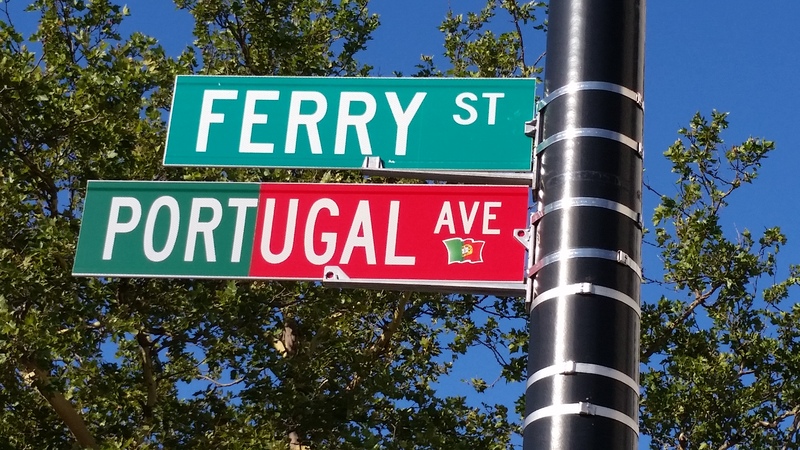 Where is New Jersey’s big Portuguese area? Newark’s Ironbound section, of course. It’s a stone’s throw east of Newark Penn Station, where just about any New Jersey Transit train will take you (yes, we were on an early morning one), and not far from Newark Broad, the other Newark train station. 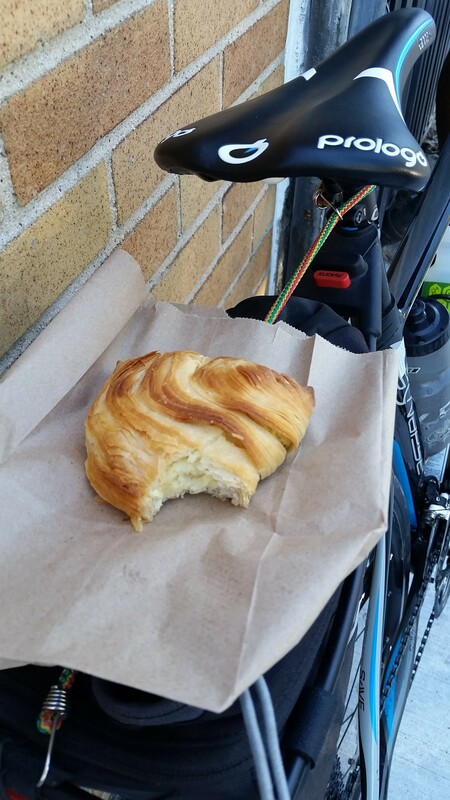 There are at least three Portuguese bakeries on Ferry Street, and we only had to bike about a half-dozen blocks before we hit the first one. 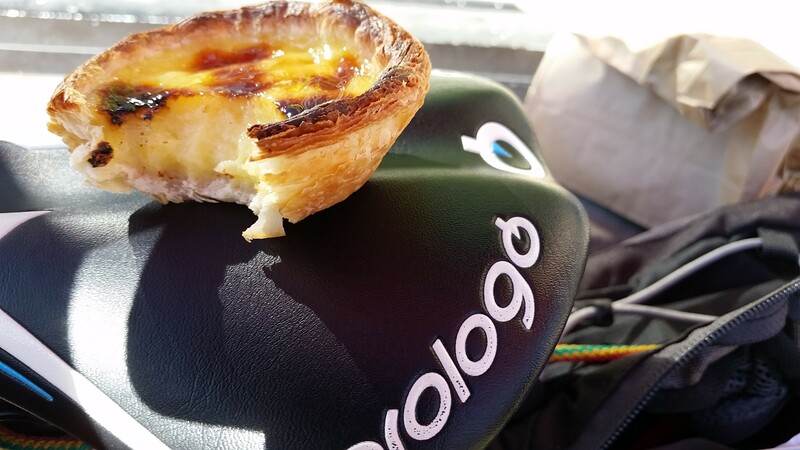 Now we’re no connoisseurs of Portuguese pastries, so we were happy with egg custard tarts and their version of a croissant. But you could get a full breakfast if you wanted. It even opens at 5 a.m. — on Sunday! There was plenty of indoor seating, but we wanted to stay near the bikes. Only later did we realize we just had to turn the corner and we’d have found several tables with chairs outside! And off the three of us went. Biking through downtown Newark to University Heights, past the new Whole Foods, and then through residential areas was surprisingly pleasant. I know this was Sunday morning, and I’m not claiming it’s like this during the week. I’ll also admit our expectations for Newark were pretty low — and that we were wrong about it. The Garmin struggled (OK, maybe our fault as newbies to this gadget) and East Coast Greenway signage was spotty at times (faded turn arrows! ), so I’m glad we had old-fashioned cue sheets as backup. (The Garmin should have had the same information but whatever…) The Newark Greenway leading us to Weequahic Park was a treat. It would be even better if those signs had a small East Coast Greenway logo on them, just to reassure us that we’re on the right route. Oh, and there’s an East Coast Greenway kiosk in the park! If you want to avoid Newark (miss the Ironbound?! ), the route at the southern end of the park seems to go a handful of blocks from the North Elizabeth station. I have no idea what the route is like. Newark Airport isn’t far away either — though I can’t imagine biking there. Oh, and then we reached Italy. Just a short, unexpected layover. 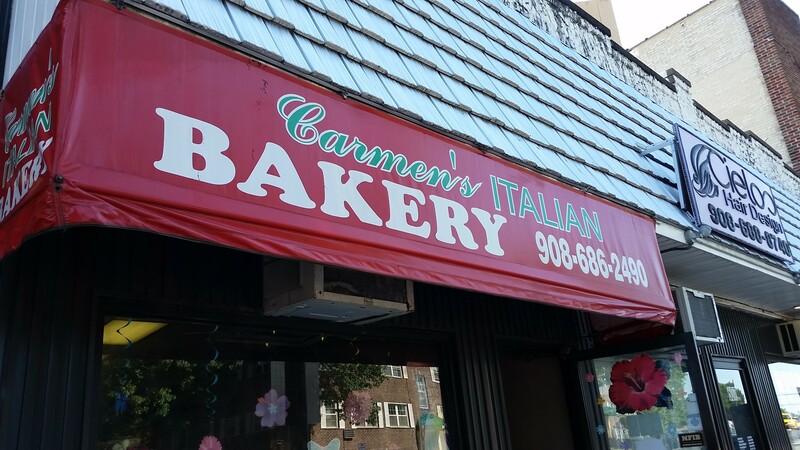 Carmen is no longer around, but his bakery remains in the family, as it has been for about 40 years. Before that it was a Bavarian bakery. 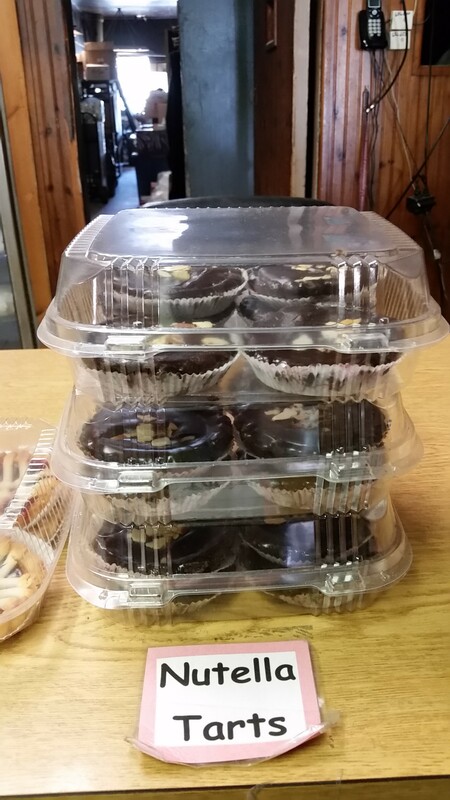 I’d have liked a Nutella tart (hey, what are calories when you are on a bike?) but they aren’t sold individually. Guess I have to get a group together for the next time just so I can try one. So I settled for a sfogliatella with sweet ricotta cheese. Now we started riding through a string of parks (and a golf course). Locals may know which trail to take, but a few more signs would be helpful for us out-of-towners. Just not this kind. Though I suppose knowing that we were supposed to stick to paved paths did limit the potential for wrong turns. A local called it an oxymoron — more moron than anything else. More suburbs. Kenilworth. Cranford. Again, a few blocks from a train station. We found the short cut under the railroad tracks (not on the cue sheets). Winfield Township. Rahway and another train station. A busy crossing between two trails that really could have used a pedestrian-activated signal. (On bikes, the extra block each way to a traffic light is no big deal. But it is for pedestrians. Thank you motorists who stopped and let us cross.) Woodbridge. An unpleasant 0.7 miles on St. Georges Avenue. The southbound route could easily avoid half of it by routing people on Midfield Road instead. Finally, Oak Tree Road, just off the route. This is New Jersey’s true Little India. There are plenty of Indian grocery stores and supermarkets in my area, plus restaurants, but this was so much more. Plus stores selling saris, jewelry, religious items … we only touched a bit of it and will be back to explore it properly. 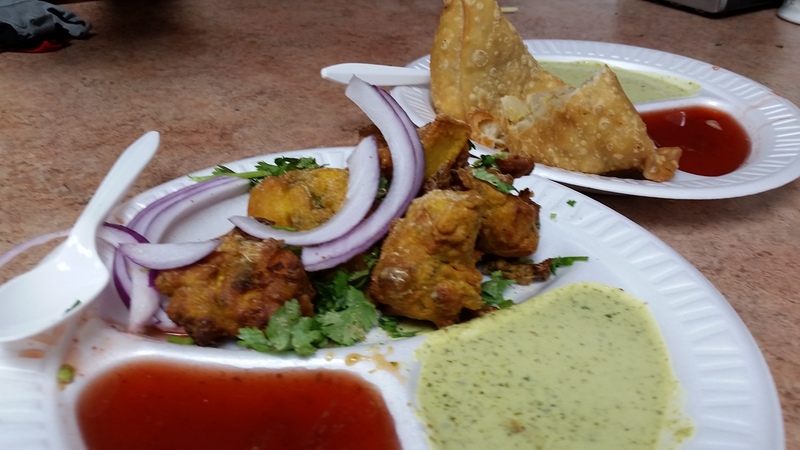 Yes, we stopped for a spot of lunch — big samosas, mixed pakora and (not in the photo) a mango lassi. We had no idea where we “should” go, so we stopped at a small dive of a place. From our table, I watched one person press fresh sugar cane juice for a couple of customers. I wonder what that tastes like — Gatorade on steroids? 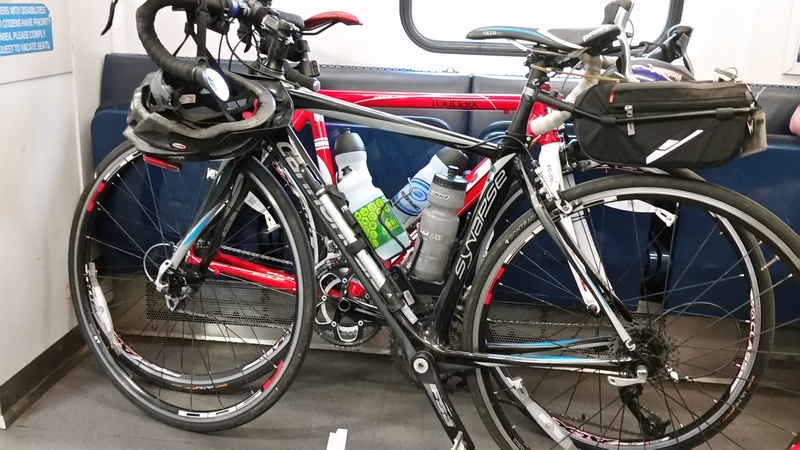 We could have called it a day after close to 30 miles and hopped the train home at Metropark. But we kept going. We gave the Thomas Edison Center at Menlo Park (not to be confused with the National Parks Service site in West Orange) a miss and rode on to Metuchen. Oh, the Middlesex Greenway. This is what we wanted in some other spots — a wide rail trail with no traffic in sight! We left the East Coast Greenway here, turning right onto the Middlesex Greenway instead of left and going into Metuchen. We wanted to quickly check out the construction going on near the train station — lots of luxury apartments, plus a Whole Foods opening in October. Some locals think it’s too much, too many people. Apparently all the projects boast bike rooms, as if they were in hipster Brooklyn. 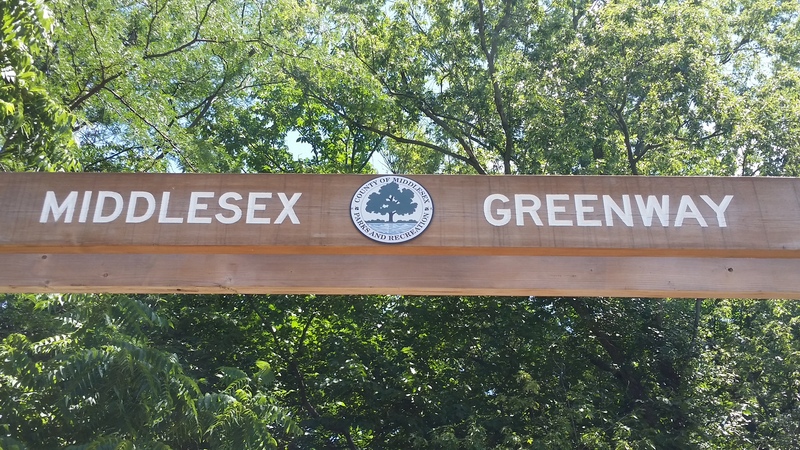 I’m guessing this will make the Middlesex Greenway even more popular. Metuchen, add some signage from the trail as well as a wide path for just those few blocks for those who don’t want to deal with traffic. We stayed on Ethel for a good while, until it ended at a T intersection. By then we were on the edge of the sprawling Rutgers campus. Left on Suttons Lane to the end, then right on Road 2 (what a name!) until it ends, then right on Cedar Lane all the way down until a traffic light at River Road and straight across into Johnson Park. Stay left, eventually getting back on the River Road sidepath, turn right at the light across the river and into New Brunswick. Stay on Albany Street and you’ll get to the New Brunswick train station. This time we hopped the train. Otherwise we might have reached Honduras or Colombia (in New Brunswick) in our jaunt around the world. It was a great 46-mile whirlwind day of travel by the time we got home. A word of warning for anyone wanting to do this: you must be comfortable cycling in traffic. Yes, there are many quiet residential roads and trails through parks. But there will be places where you need to be confident and take your lane to make a turn. This is not like the East Coast Greenway route south of New Brunswick that uses the D&R Canal towpath and just crosses roads, often with the help of a pedestrian-activated signal. 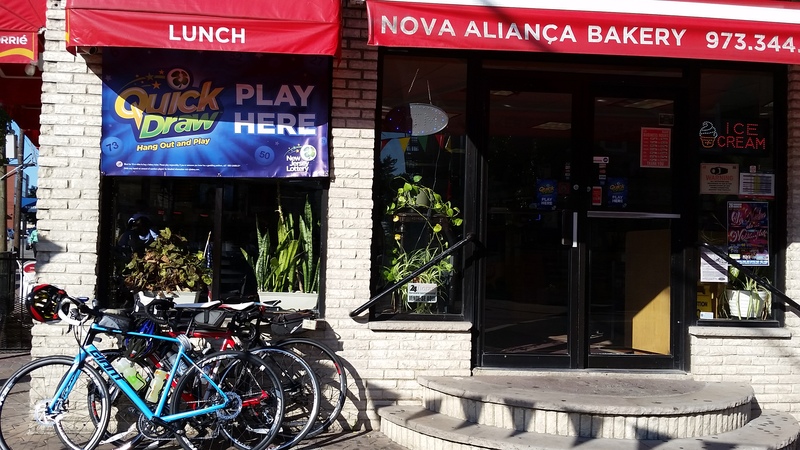 It’s also not a fast ride, and not just because we stopped to eat a few times. It’s urban cycling, with lots of turns to watch for and lots of traffic lights. And yes, I would do it again. UPDATE: A ice cream place on Oak Tree Road to try next time, even though it means biking up a hill. A gardener (along with the Brit) who has discovered there is more than hybrid tomatoes. 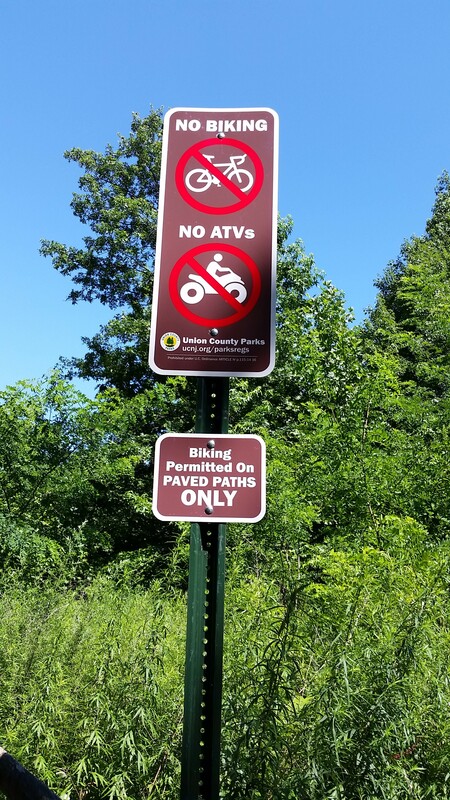 This entry was posted in bike ride, bike trail and tagged East River Greenway, Metropark, Metuchen, Middlesex Greenway, New Brunswick, New Jersey, Newark, Oak Tree Road. Bookmark the permalink. Amazing trip — thanks for sharing. Hi from Cambridge, England where the bicyclists ð´ ride too fast and cause accidents. This week it is genetics and I have not finished my readings.